Afghanistan’s President Ashraf Ghani on Wednesday (28 November) announced in Geneva a 12-person team for prospective peace talks with the Taliban, as his government pledged unwavering commitment to resolve the conflict despite persistent bloodshed. The Afghan government, Western diplomats and United Nations officials have in recent weeks raised hopes of finally reaching a deal to end the Taliban’s 17-year insurgency. Such optimism has been tempered by continuing attacks, including a massive blast outside a British security company’s compound in Kabul late Wednesday — claimed by the Taliban — which killed at least 10 people. The latest violence came just hours after Ghani told an international conference in Geneva that his government had formed a 12-person negotiating team, comprised of both men and women, to talk peace with the Taliban. It will be led Ghani’s chief of staff, Abdul Salam Rahimi, a former humanitarian worker and ex-deputy Afghan finance minister who is considered one of the president’s closest aides. US envoy Zalmay Khalilzad, who met with the Taliban in Qatar earlier this month, had been pushing Ghani to announce a negotiating team. The president also laid out what he termed a “roadmap” for the talks and four principles that he said must form the backbone of any agreement. They include respecting Afghanistan’s constitution and the total rejection of interference in domestic affairs by foreign “terrorist” and criminal groups. “We seek a peace agreement in which the Afghan Taliban would be included in a democratic and inclusive society,” Ghani said. Addressing reporters at the end of the conference that saw major donors pledge sustained commitment to the Kabul government, Afghanistan’s national security advisor Hamdullah Mohib said Wednesday’s bomb blast would not deter from the peace push. “Events like this bolster our resolve for peace,” he said. Asked why he was confident negotiations were possible despite the violence and the Taliban’s lack of public commitment, Mohib claimed the militants were facing renewed pressure to talk, including from foreign backers. Civil society activists in Geneva for the conference voiced concern that in pursuing a deal the Kabul government might give ground on women’s rights to the Taliban, a group notorious for its oppressive treatment of women. 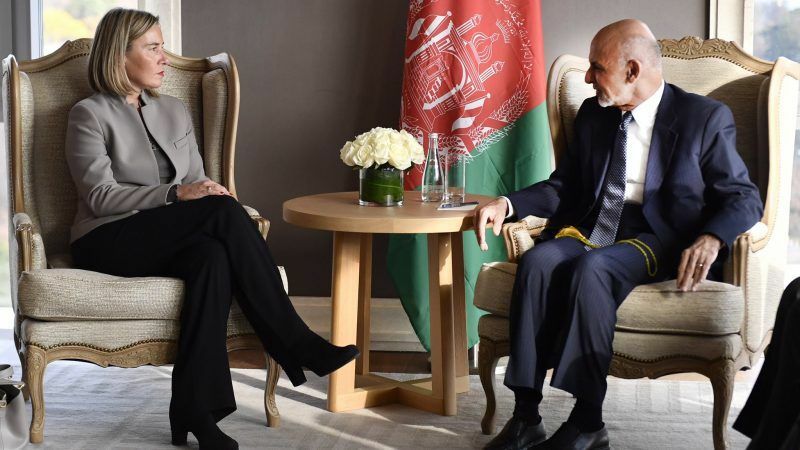 Ghani’s government has won praise for trying to redress extreme gender gaps in Afghanistan and the president assured diplomats that he would not compromise on women’s rights to strike a deal. European Union foreign affairs chief Federica Mogherini told the conference the bloc believed “it is time for concrete talks about peace to begin”. The EU was prepared to act as the “guarantor” of the negotiations, she added. Ghani said earlier this month it was “not a question of if, but when” an agreement would be reached with the Taliban. Khalilzad has said he is “cautiously optimistic” for an end to the conflict.